Latest ITI Pass Govt Jobs 2018 are updated on this page. In this page, job hunters can find the latest ITI Govt Jobs 2018. ITI holders in different trades can keep updated themselves by checking this entire page. Because we have given the latest ITI Government Jobs 2018 in various organizations. So, check the below given table and find out the latest stuff regarding Industrial Training Institutes Jobs 2018. The major role of ITI Job Openings 2018 is to contribute the technical support to the various industries. Job fighters can check the current employment notifications of ITI Pass Government Jobs 2018 directly from this page. Scroll down and check the latest ITI Govt Jobs 2018, Govt Jobs For ITI Holders 2018. We all know that the Industrial Training Institutes provides the technical education in different trades. Check the above table and apply suitable post as per your qualification wise through Online mode for the ITI Govt Jobs 2018. After checking all the information aspirants can apply for the ITI Pass Govt Jobs 2018 depends upon the number of posts available. Here on this page, we are sharing the entire details which help the job seekers to get the Govt Jobs. We advise to the aspirants go through the recruitment. And if you are eligible and interest in the particular organization then click on the Apply link. After that verify all the info and apply before the closing date which is mentioned in the official notification. A vast number of aspirants had passed their ITI. And all the students are curiously searching for the ITI Pass Govt Jobs 2018. For the sake of contenders, on this page, we have contributed valuable details such as ITI Fitter Jobs in Government Sector, ITI Railway Jobs 2018, ITI Electrician Jobs 2018 in Indian Railway, ITI Jobs 2018 in BHEL, ITI Electrician Jobs 2018 in Power Plant, ITI Jobs 2018 in Tata Steel, ITI Fitter Job in Indian Army 2018 and much more. We have also provided the relevant official Advertisement and application form. So without wasting time contenders can just click on the above given table and apply for the suitable position. Along with ITI Railway Jobs 2018 aspirants can also check the latest ITI Bank Jobs from this page. The Government Organizations such as MP Vyapam, HSL, Arunachal Pradesh PSC, NCCS, Telangana Fishery Department, JSHB, Air India Limited, APSPDCL, HPPSC, HSSC, IPR, SER, SSC, KPCL, Northern Railway, South Eastern Railway, Delhi Police, Naval Dockyard, Madhya Pradesh Power Transmission Company Limited, NTPC, ECIL, IOCL, Hindustan Newsprint Limited, Power Grid Corporation of India Limited and more authorities are ready to release various recruitments at their official websites for the various posts. So, contenders, those who had done their ITI at any of the recognized university or institute can utilize the current article and apply for ITI Govt Jobs 2018 through online mode. This is the perfect platform for the contenders those who are not having higher education qualification. Also, we insist the aspirants that we have shared only ITI Job Openings 2018 on this page. So this is the only page for ITI Pass students and looking for ITI Pass Govt Jobs 2018. After completing ITI, tradesmen can undergo Apprenticeship training in different industries. ITI Trade Apprentices, Ex- ITI Trade Apprenticeship, Junior Technician, Multi Skill Assistant, Stipendary Trainee, Constable (Tradesman), Apprenticeship training, Carpenter, Technician (Semi Skilled), Vehicle Mechanic, Technician Grade IV, Technician B, Wireman, Line Attendant etc are the major posts that the Government authorities are released recently. First of all, all the candidates need to refer the complete recruitment carefully, After that, you have to take a look at the post wise vacancy details, education and essential qualification, age limit, age details, application fee, selection process, salary details etc. After finding all the details aspirants have to log in to the official website to apply for ITI Pass Govt Jobs 2018. Also, we have evaluated the detailed steps from our website. So follow how to apply for latest ITI Jobs 2018 and pay an application fee and submit your application forms before the deadline. After that, you have to concentrate on selection rounds. Generally, the authorities of Government conducts some of the recruitment rounds for the applied aspirants. In order to select the suitable aspirants, the authorities conduct Written Exam and personal interview. At first, you have to prepare well and crack the test with the help of Syllabus and Previous Year Question Papers. So download the entire material from our site for different posts and prepare well. Those who secure minimum cut off marks in the written test are only eligible for the final round that is an interview. At the official website, you can find the interview date. We are also available here for the people to guide their in a best and good way. Therefore, you can easily get selected into the departments. And the selected job applicants can receive a handsome pay scale along with the grade pay. 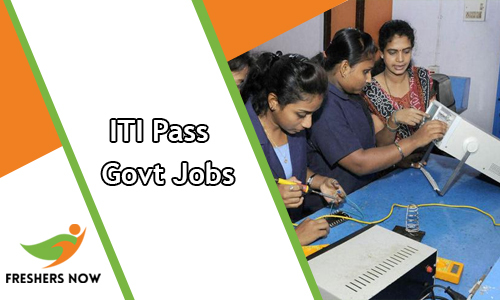 This whole page is for the job hunters who are looking for the ITI Pass Govt Jobs 2018. At the above table, aspirants are able to check the lately released ITI Govt Job 2018 Recruitment Advertisements. Both the freshers and experienced contenders can check and apply for current ITI Pass Govt Job Openings 2018. At present, there are 10000+ ITI Govt Jobs 2018 are available. An enormous number of vacant positions are available at different departments under the Government Sector. We have grabbed all the information related to the Openings. So our main suggestion is go through this page and proceed to the further information. And get the latest job openings from the above links. We are sure that contenders can get a bright future in the Government Sector. Our website www.freshersnow.com is the exact source where you can find all the latest Government Jobs in state and central. Visit our website and keep updating yourself with the fresh updates. Because on our website job hunters can find the genuine information.